To achieve insulation of the attic space from the extreme heat that radiates through the roof, the sheathing, and the shingles, spray foam needs to be applied directly to the underside of the roof deck. This provides the attic with the type of insulation that blocks out severe temperatures. The attic then becomes as comfortable as any other room in the house, since it is now a “semi-conditioned” space. An example of why “breathing wood” issue is not much of an issue can be found in the furniture industry. Most manufacturers actually kiln dry wood before it is used. Through extensive research, we learned that manufacturers claim that wood can deteriorate faster if it is allowed to “breathe”. Kiln dry wood contains a small amount of moisture and it is used in all furniture. That moisture generates cracks and splits as it continues to dry out. Manufacturers know that wood must be totally sealed so they will take extra precautions to make sure that the wood is completely sealed. The same is true of the wooden shingles on your roof and SPF insulation. 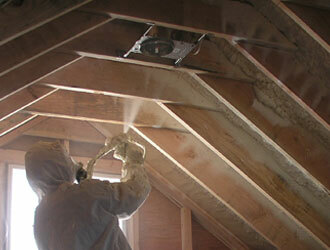 Spray foam reduces energy consumption in several ways when it is applied on a roof. It can essentially eliminate energy loss from ducts located in the attic. With less infiltration and exfiltration, excess moisture isn’t pulled into the attic since the top of the building is much tighter. Spray foam also reduces infiltration through the ceiling. It reduces energy consumption because the temperature in the attic is lower. The issue of heat gain/loss from ducts, as well as duct leakage is substantially reduced. Sealing the roof from air infiltration is more feasible than sealing the ceiling from air infiltration. The living space will be clearer of loose insulation and dust. When the attic is sealed, test show that energy costs are reduced. Further information is available from ASHRAE (8700-527-4723) in a publication titled "Vented and Sealed Attics in Hot Climates."